At the occasion of the 6th International Conference of the Consumer Citizenship Network CCN -Making a Difference - March 24, 2009 Technische Universität Berlin/ Germany. In her capacity as Professor in the Faculty of Education at Mount Saint Vincent University, Halifax Nova Scotia, Canada, Sue McGregor has contributed substantially to the promotion of home economics and consumer education for about 35 years. 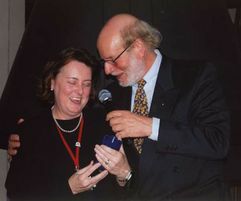 The TOPACE Jury did review and appreciate her continuous efforts and unanimously decided to award Sue McGregor the Tower Person Award for Consumer Educators 2009. Transdisciplinary inquiry and integral consumption. Furthermore, her record shows an active involvement in worldwide networking, in government and NGO consultancy and an impressive list of publications in renowned books and journals.